For a beginner learning the guitar, it is of utmost importance that you buy the right one which suits your needs. In this post, we take a look at five of the best guitars for beginners in India. There are not many Indian guitar brands that can match the kind of quality desired from guitars. The best guitars for beginners that are available in India are thus mostly of foreign origin. We’ve limited the list to guitars below Rs 15000, as most beginners would not like to spend too much on their first guitar. The Yamaha F310 is a great all-round guitar and offers the best bang for the buck. For its powerhouse performance, we feel it is the best guitar for beginners in India. 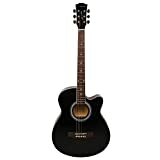 It is also the most popular and is the most widely sold guitar online, in its price category. The guitar has a solid build quality. It can easily last up to 10 years for the average consumer. High-quality materials used in the construction. Comfortable to play and hold. Produces a clear, comforting and mellow sound. The guitar stays mostly in tune, so no need for frequent tuning. Fender is more popular for its electric guitars. However, it does have some decent acoustic guitars and the CD 60 is one of them. Some argue that it is the best guitar for beginners, placing it higher than the Yamaha F310. Excellent sound for the cost. It creates a mellow and strong loud sound that is appealing. The tone is consistent and in melody for prolonged periods. Select tonewoods used in construction. It’s lightweight and easy to hold. Amazing action making it easier to play with. 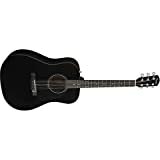 Another powerhouse from Yamaha, this guitar has very few differences from the Yamaha F310 acoustic guitar. The most noticeable is the cutaway design in the former which is absent in the F310. Yamaha has built this guitar with the same solid build quality as in the F310. This means that it’s highly durable and long lasting. The materials used in the construction are of high quality. The cutaway design coupled with the solid build does give this guitar an appealing look. The guitar is quite comfortable to hold and play. Great mellow and appealing sounds. The Yamaha C40 is the one and only true classical guitar (nylon strings) available in the Indian market. 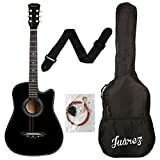 This is the best guitar for beginners in India for those who are into more classical music like flamenco. It is one of the cheapest full-sized classical guitars in India. Though made of laminated wood, it is well designed. Solid build quality expected from the Yamaha. As the strings are made of nylon, it is easy on the fingers and comfortable to play. Though the Fender is the last on our list, its quality cannot be doubted. It is the quality that this guitar offers for this price is the attraction. Of course, it is the second choice when it is compared to the Fender CD-60. As expected, the woods may not be of great quality, but it is good enough for beginner guitars. The quality of sound is definitely good when you compare it to guitars even in the higher price ranges. Strings and tuners are of high quality. If you are on a low budget, there are a few options available. They are neither amongst the top and best guitars for beginners in India nor fit in amongst the better guitars in the Indian Market. The top option for the budget minded. 39 inches guitar which means that it is easy to hold and good for children. 38-inch guitar suitable for kids and short people. Sound quality and build quality okay if not looking for a long-term investment in a guitar. The glossy finish gives a great look. Plastic body means it will not last long. 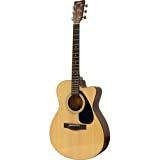 It goes without saying that whenever you set out to buy something, you need to know what type of acoustic or electric guitar that you are looking for. For beginners, the best type of guitar is acoustic, though this is not a hard and fast rule. In your quest for the best guitar for beginners in India, there are some things you need to keep in mind. The standard sizes of guitars in the Indian market would suit most people. However, for your child or someone with small hands, you may want to look for smaller sized guitars that he or she may be comfortable with. We will cover more about choosing the right guitar for your child towards the later part of the post. Logic says that the best to start off would be a classical guitar. This is because a classical guitar has nylon strings which make it easier to play. However, the type of music that you intend to play would determine whether you want to go for nylon or steel string acoustic guitars. For pop and blues, the steel string acoustic guitar is an ideal choice whereas for classical music, the choice would be the nylon string or classical acoustic guitar. The choice of wood is generally between solid wood and laminated. While solid wood guitars produce better sound, they are obviously more expensive. However, there are laminated types which sound good provided that they are smartly constructed. You just need to look out for such guitars. There is no need to pay too much attention to this aspect if you are a beginner, but do ensure there are no cheap plastic or low-quality woods used in the construction. There are some considerations that need to be kept in mind while buying a guitar for your child. The first obvious thing to look out for is size. For kids above 5 feet, the standard size guitar will do. Kids between 4 ½ to 5 feet will need a ¾ size guitar while kids around 4 feet would require a ½ size guitar. The guitar action has to be on the lower side for kids but not too low that they produce an annoying buzz. A low action would make it easier for the child to press the strings and in turn would be comfortable to play. Budget is always a consideration whenever one makes an investment. As far as buying a guitar for your child, there is no point in going for one that is too expensive. Then again, it would depend on the age of the child. If he or she is old enough and shows adequate interest in the hobby, then investing in the best available option would make sense. Read this article by Wikihow to learn more. There are many cheaper options out there, which would serve the purpose of a beginner’s guitar. There is a tendency or a temptation to save money and go for these. But, as the saying goes – you get what you pay for. The guitars in the list offer great value for the price. 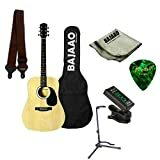 They are truly the best guitars for beginners in India. Let us know your thoughts in the comment section below and best of luck with your guitar lessons!